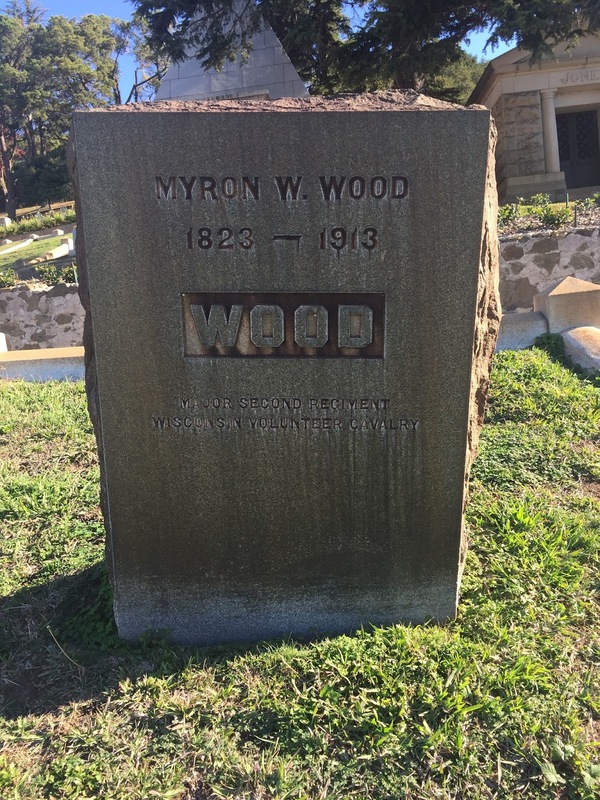 He is remembered today for writing the "History of Alameda County, California" a two volume set of paid biographies published in 1883. The biographies were invariably flattering and generally omitted some important but inconvenient genealogical or biographical data. The biographies were mostly those of residents of Murray Township, which at that time included the towns of Altamont, Dublin, Livermore, Midway, Pleasanton and Suñol, and their surrounding countryside. A few of the subjects lived elsewhere, but owned land or had business interests in Murray Township. 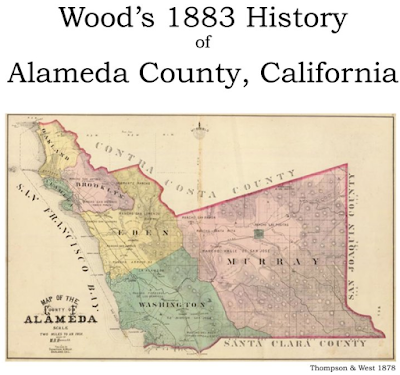 Wood's book was typical of county histories published in the late 19th century. The books were commercial ventures and not scholarly works. They included biographies of only male citizens. In derisive reference to the portraits included with the biographies, the publications became known as "mug books." 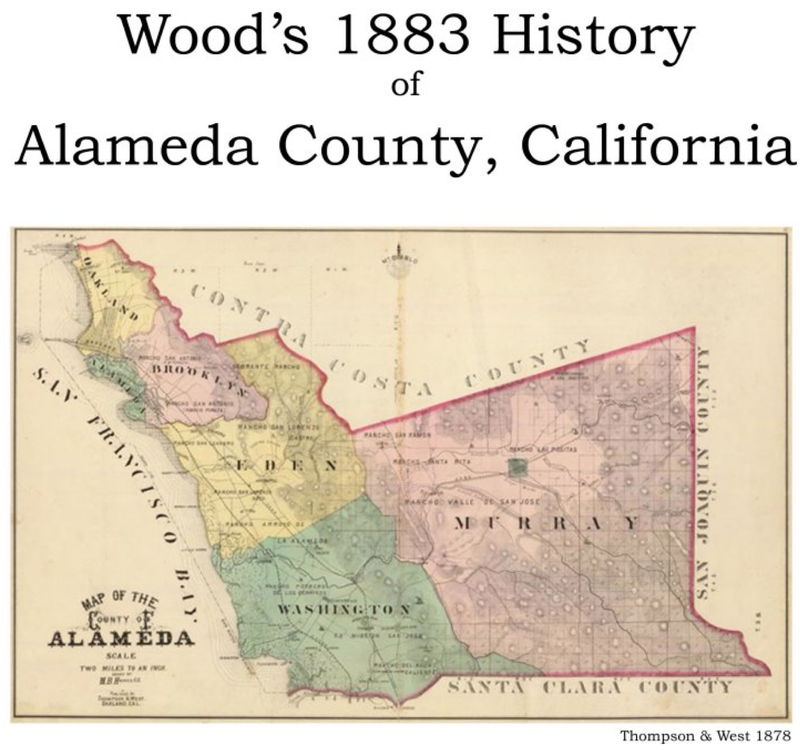 Wood's two-volume, 1001page set has become a valuable reference source for the early history of Alameda County, as well as an important resource for genealogists. 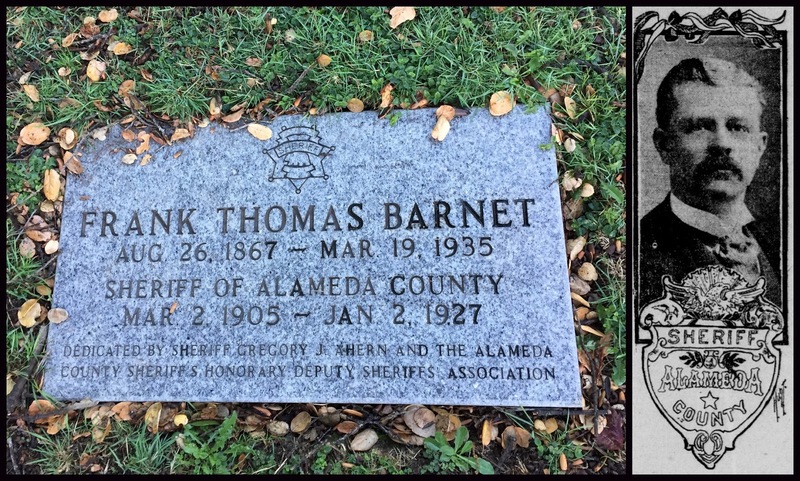 Frank Barnett (1867-1935) was the Alameda County Sheriff from 1905-1927. His grave remained unmarked in the family plot at Mountain View Cemetery until current Sheriff Greg Ahern and the Deputy Sheriff's Association placed a marker on his grave. Despite having a colorful and arguably successful career, he is best remembered for being a suspect in the case of Elizabeth "Bessie" Ferguson, a nurse whose dismembered body was found in 1925, which led to him being defeated by a member of the KKK. Ferguson disappeared after telling her mother that she was headed from San Francisco to Oakland to meet Barnett. Ferguson was a known blackmailer, who tried to pass off her sister's infant as the child of at least eleven prominent men in the community, including Barnet. Allegedly, her mother had warned her to leave the Sheriff alone, as he was too powerful to handle. Bessie replied, "Don't worry Mother, he will pay like all the rest of them." She went missing that night. Ferguson was known to have used a number of aliases over the years, including checking into to her hotel as Bessie Loren the night she disappeared. 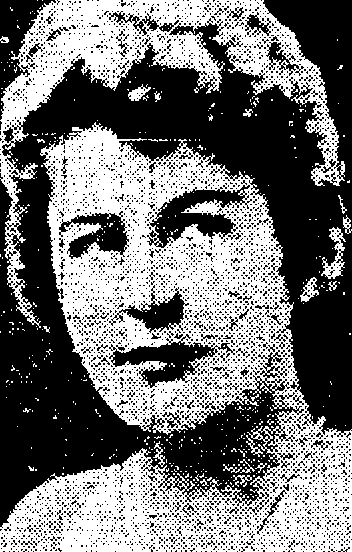 A March 5, 1926 account in the Oakland Tribune described her as, "A buxom blonde, attractive, with a certain charm of manner..." She allegedly used the blackmail money to care for her family. Parts of her body were found in a sack floating in the estuary between Oakland and Alameda near Bay Farm Island and more in the tules by the bay in El Cerrito. The case became known as the "Tule Murder Case." Her skin had been stripped from her bones with acid and some of her flesh had been cooked and fed to dogs. The prime suspect became a veterinary surgeon who it was believed was the only person who had the skills to perform such a detailed dismemberment. Despite the involvement of then-District Attorney Earl Warren and a number of leading criminologists, the case was never solved and Barnet was eventually cleared of wrongdoing. Years later, Mary Shaw a reporter in the East Bay, revealed to the Earl Warren Oral History Project at the Bancroft Library in Berkeley that she had interviewed Sheriff Barnet. He revealed to her that he was at a party with Ferguson where everyone was pretty drunk. He admitted that he hit her causing her to fall and hit her head on some fireplace irons. Rather than use this in her story, she told her editors that Barnet refused to talk. Barnet was originally appointed to his post by the Alameda County Board of Supervisors after the death of Sheriff John Bishop. He was easily reelected until the Ferguson murder when Piedmont Police Chief Burton F. Becker challenged him and beat him my 13,000 votes. Becker was a member of the Ku Klux Klan, but hid behind a "Christian morality" platform of cleaning up problems related to "liquor and dope." Barnet was known to be vocally supportive of many so-called vices including drinking, gambling and prostitution. Upon taking office, Becker appointment fellow Klansmen as undersheriff and county jailer. In 1930, Becker was investigated and charged on corruption charges by Earl Warren and sent to San Quentin Prison. Ironically, he was accused of taking bribes from bootleggers and slot-machine operators. Diogenes Angelakos, was a professor emeritus of electronic engineering at the University of California at Berkeley who survived an attack by the Unabomber. Angelakos was recognized one of world's foremost experts on the complex nature of the scattering of electromagnetic waves, microwaves and antennas. He served as director of the Electronics Research Laboratory at Berkeley from 1964 to 1985 and was credited with building the small departmental research group into one of the university's largest research laboratories, with a yearly budget of some $35 million. On the morning of July 2, 1982 while lounging in a room near his laboratory he noticed an oddly shaped silver cylinder that looked like a turpentine can, studded with gauges and dials. After grabbing the handle a pipe bomb placed inside the cylinder exploded, sending shrapnel through his right hand and into his face. His injuries required surgery to repair the tendons in his hand and he retained permanent powder burns on his fingers as a reminder of the explosion. He avoided more serious injuries, or even death, when a gasoline component of the bomb failed to ignite. The bomb was later determined by Federal law-enforcement officials to have been designed by Theodore Kaczynski, the serial bomber known as the Unabomber. 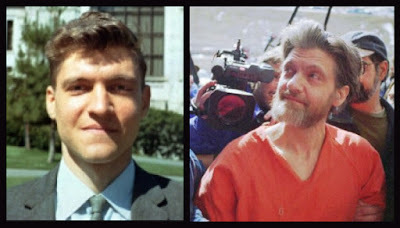 Kaczynski engaged in a nationwide bombing campaign against people involved with modern technology, planting or mailing numerous homemade bombs, ultimately killing a total of three people and injuring 23 others. He also is known for his wide-ranging social critiques, which opposed industrialization and modern technology while advancing a nature-centered form of anarchism. Dr. Angelakos's life was touched by the Unabomber's violence again three years later when a 26-year-old Berkeley graduate student, Air Force Captain John Hauser, was badly maimed by another bomb left in his laboratory's building. Angelakos, who was working nearby at the time, was one of the first on the scene after the explosion. Hauser lost the use of his right hand and arm and his sight in his left eye. In an 1993 interview with The New York Times, he said he blamed injuries he received in the bombing for robbing him of precious time with his wife, Helen, who died of cancer shortly after the explosion. He died of prostate cancer 15 years after the attack.